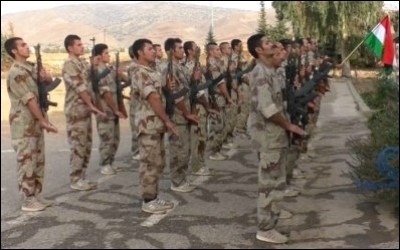 Iranian Kurdish fighters train in an undated photo released by the PDKI last month. The instability that has swept over the Middle East over the past half-decade has its winners and its losers. For the most part, the much-beleaguered Kurds are to be numbered in the former camp. In Syria, the long-silent Kurdish minority now finds itself allied with U.S. air power and special forces, and controlling a large, de facto autonomous area in the country's north. In Iraq, the Kurdish Regional Government is operating in what is increasingly an all-but-sovereign territory. In Turkey, things are moving in a less positive direction, but this hardly attests to Kurdish weakness or silence. The formidable Kurdish Workers' Party (PKK) is once more engaged in insurgency against the government based in Ankara. The odd man out has been the Kurdish community of Iran, which has faced a much tougher road in defending itself than other Kurdish communities in the Middle East. But there are signs that this is beginning to change. The three major Kurdish movements—the PDKI (Democratic Party of Iranian Kurdistan), PAK (Kurdish Freedom Party), and PJAK (Party for a Free Life in Kurdistan)—are now overtly engaged in armed insurgency against the regime in Tehran. There are troubling signs that Iran's clerical rulers might be prepared to employ a scorched-earth policy in response. The three main Iranian Kurdish movements are now overtly engaged in armed insurgency. A scarcely noticed report in early November on the Iraqi Kurdish website Rudaw states: "Kurdish guerrillas suspect Iran used chemical weapons against them." The Islamic heartland is now awash in chemical weapons use—ranging from the Bashar Assad regime in Syria to the Islamic State. Hence it is conceivable that Assad's main strategic partner—Iran—will not hesitate to use chemical munitions against the Kurds. What led to Iran's current conflict with the Kurds? Iran's Islamist rulers see ethnic separatist sentiment as a threat to clerical rule. After the 1979 revolution, the PDKI fell victim to the vicious closing of accounts carried out by Iran's new Islamist rulers. These rulers were and are well aware of the potential that ethnic separatist sentiment has for weakening their regime and threatening its rule. Consequently, they have made great efforts to snuff out Kurdish separatist sentiment and organizations. To achieve this, they have employed a variety of methods including, famously, the assassination of exiled Iranian Kurdish leaders in Europe. In July 1989, Iranian diplomatic personnel murdered Dr. Abdul Rahman Ghassemlou, the secretary general of the PDKI, in Vienna. He had been sent to negotiate for greater self-rule and Kurdish civil rights in the area of Iranian Kurdistan. Three years later, in September 1992, three prominent Iranian Kurdish leaders, Sadegh Sharafkandi, Fattah Abdoli, and Homayoun Ardalan, and their translator were shot dead in the Mykonos restaurant in West Berlin. A Berlin court determined that the assassinations were ordered by the "highest state levels" in Iran, and that Hezbollah was part of the terrorist team. Iran's Revolutionary Guard also waged brutal, largely successful campaigns of repression in the Kurdish areas of Iran itself. In 1996, hard hit by these relentless attacks, the PDKI declared a unilateral ceasefire. Two other parties have come on the scene since the Islamic Revolution, though neither has the strength of the PDKI. The PAK was founded in 1991 as the Revolutionary Union of Kurdistan, and changing its name in 2007 to its current form. Recently, the party's militants have taken part in the fight against Islamic State in the Kirkuk area of Iraq and are reported to have received training from U.S. special forces. The third major party, PJAK, is the franchise of the Kurdish Workers Party (PKK) of Turkey among the Iranian Kurds. Founded in 1997, PJAK has engaged in intermittent guerrilla warfare against the Iranian regime since 2004. 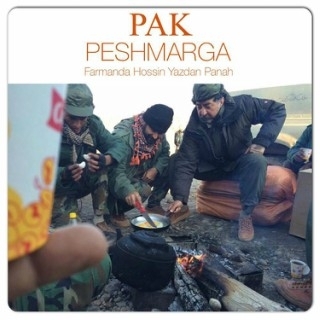 Like the PDKI, both the PAK and the PJAK are based in the Kurdish-controlled part of northern Iraq. For the two decades since the ceasefire, the Kurdish areas of Iran have remained largely quiescent. The hand of the Revolutionary Guards remains heavy on the population. Any sign of independent organization is swiftly dealt with. According to the International Campaign for Human Rights in Iran: "Execution of Kurdish activists, without fair trials and following torture, increasingly appears as a systematic, politically motivated process." On February 25 of this year, the PDKI announced the re-commencement of "armed resistance against the Islamic Republic of Iran." The announcement was attributed to "growing discontent," but this was not a sudden decision. Rather, preparations, including the training of fighters, had been going on for some time. Two other parties, the PAK and Komala (a small leftist Kurdish nationalist party founded in 1969) declared their support for the PDKI declaration. Photos released on social media last month ostensibly show PJAK fighters on the front against ISIS in Mosul. The growing conflict between the Iranian Kurds and the regime has repercussions beyond Iran's borders. Iran's leaders have been quick to identify the hand of Saudi Arabia behind the renewed insurgency. Mohsen Rezai, an influential former commander of the Revolutionary Guards, was quoted by Reuters as saying that "[Saudi Arabia] gives money to any anti-revolutionary who comes near the border and says 'Go carry out operations." In response, Saudi Arabia, and indeed the PDKI, has rejected these allegations as baseless. Hiwa Bahrami, a spokesman for the party, told the Kurdish ARA News site that "Both sides [Iran and Saudi Arabia] are trying to support the opponents of each other. But we have, at this time, no contacts [in Saudi Arabia] and the Saudis have not contacted us." Iran's leaders have yet to produce any concrete evidence for the accusation. But anything that worsens the Saudi-Iranian rivalry now playing out across the Middle East is a cause for alarm. In addition, the Iranian Kurds' return to militancy further complicates relations between Iran and the Kurdish autonomous area in northern Iraq. Iran supports the powerful Shi'a militias in Iraq, who are engaged in a number of territorial disputes with the Iraqi Kurds. In addition, Iraqi Kurdish aspirations for independence stand in the way of the Iranian desire for a united, Shi'a-dominated Iraq controlled by pro-Iranian elements. The beginnings of the Kurdish insurgency in Iran, emerging from across the border in Kurdish-controlled northern Iraq, only adds fuel to a combustible situation. Where might all this be heading? First, it is worth remembering that the major gains made by Kurds in Iraq and then in Syria resulted from the destruction of the Saddam Hussein regime in the former country and the contraction of the Assad regime in the latter. In Iran (as in Turkey), by contrast, the authorities stand at the head of a powerful security state, which shows no signs of weakness or fragmentation. Hence, it would be wrong to expect major change in the status or situation of Iran's Kurds in the immediate future. Nevertheless, the re-emergence of Kurdish insurgency in Iran is a significant development. Iran has proved a champion at exporting unrest and paramilitary activity to neighboring countries—see Lebanese Hezbollah, the Shi'a militias of Iraq, Ansar Allah in Yemen, and others. 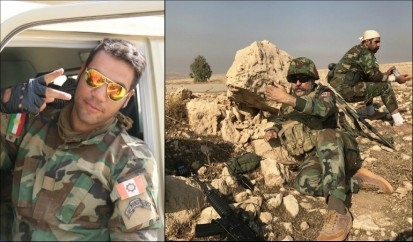 The revived Kurdish armed campaign is the first attempt in a while to bring the fires of regional instability—so ably stoked in a variety of arenas by the Iranian Revolutionary Guards—back across the borders into Iran itself. Given the uptick in Iran's efforts to procure chemical weapons, the Kurds face grave danger if the West and responsible Sunni states fail to combat Tehran's growing jingoism. In The Field of Fight: How We Can Win the Global War Against Radical Islam and Its Allies (St. Martin's Press, 2016), the National Security Advisor-designate, Lieutenant-General (ret.) Michael Flynn, and historian and foreign policy analyst Michael Ledeen write that among the documents found during the Osama bin Laden raid in 2011 was a letter revealing that "al-Qaeda was working on chemical and biological weapons in Iran." The Iranians, great masters at fomenting revolts abroad, are now faced with an emergent insurgency at home. German intelligence reports in 2015 documented Iran's efforts to obtain illicit chemical and biological weapons technology. And in October, the Congressional Research Service (CRS) report on "Iran's Foreign and Defense Policies" cited disturbing information on the Islamic Republic's chemical and biological weapons development programs. According to the CRS study, "U.S. reports indicate that Iran has the capability to produce chemical warfare (CW) agents and 'probably' has the capability to produce some biological warfare agents for offensive purposes, if it made the decision to do so." Jonathan Spyer, a fellow at the Middle East Forum, is director of the Rubin Center for Research in International Affairs. Benjamin Weinthal is a fellow at the Foundation for Defense of Democracies.